is honored on Panel 11W, Line 41 of the Vietnam Veterans Memorial. You gave your life for your Country, and for this we Salute You. The Distinguished Service Cross is presented to George Thomas Kelly, III, First Lieutenant (Field Artillery), U.S. Army, for extraordinary heroism in connection with military operations involving an opposing armed force in the Republic of Viet Nam, while serving with Battery C, 6th Battalion, 14th Artillery, I Field Force, Vietnam. 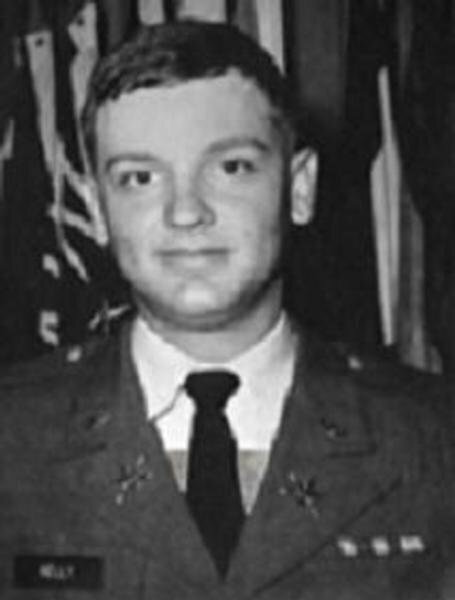 First Lieutenant Kelly distinguished himself while serving as forward observer with a Vietnamese battalion near Dak Seang. Lieutenant Kelly's battalion had been engaged with a North Vietnamese Regiment in continuous combat for several days. During the previous night the battalion had been aggressively attacked by the enemy who had moved to within thirty meters of the battalion's perimeter. Only through Lieutenant Kelly's daring and precise artillery adjustment was the enemy attack repulsed. During the early afternoon of 22 April 1970, Lieutenant Kelly led his beleaguered comrades in an attempt to break through the enemy encirclement and reach Camp Dak Seang. After several hours of travel, a bomb crater large enough to be utilized as a landing zone was discovered. A medical evacuation helicopter was immediately summoned by radio. Moments after the helicopter's arrival, the enemy emerged from the tree line and struck Lieutenant Kelly's force again. Because of the intense hostile fire, the heavily laden helicopter experienced great difficulty in taking off. Lieutenant Kelly unhesitantly left the ship to engage the enemy in an attempt to divert their fire and to allow the helicopter to depart. As Lieutenant Kelly maneuvered to one side of the clearing to provide cover fire, he was mortally wounded by enemy small arms fire. First Lieutenant Kelly's extraordinary heroism and devotion to duty, at the cost of his life, were in keeping with the highest traditions of the military service and reflect great credit upon himself, his unit, and the United States Army.